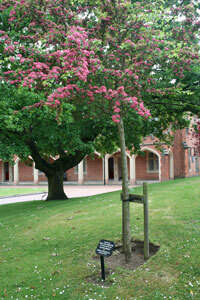 The Prince of Wales visited the Almshouses on the 10th July 1934 and planted an oak tree which still thrives. 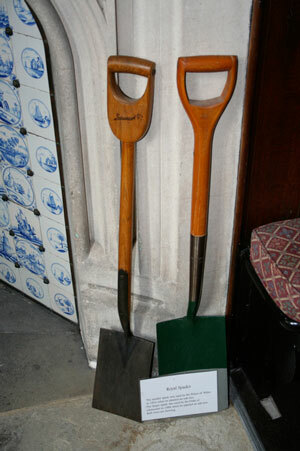 He used the spade (left) which is signed “Edward” on the handle. 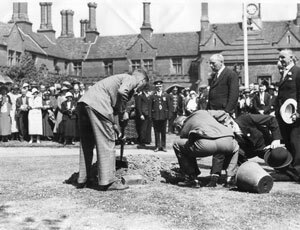 The spade (right) was used by the Duke of Gloucester during his visit in 1988. On that occasion he was presented with the first of 500 prints of the Almshouses, commissioned that year to raise money to restore the Pumphouse. 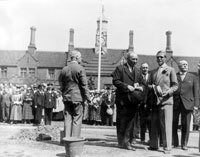 On the same day the Prince of Wales had luncheon at Arbury, visited the Hall and Phillips hat factory in Nuneaton, and declared the new Swinnerton School in Avenue Road, Nuneaton, open. 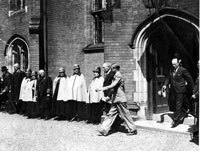 The Duke of Kent paid a surprise visit to the Almshouses on May 4th 2016. He was accompanied by the Lord Lieutenant of Warwickshire Tim Cox and he met Governors, Residents and Almshouses Manager Mrs. Ann Haywood. 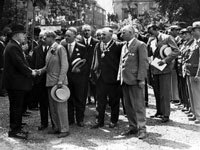 It was a happy and relaxed visit with the Duke later writing to express his appreciation. 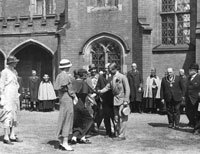 This was the third occasion on which a member of the Royal family had visited the Elizabethan-style building constructed in 1840. Rotarian Ken Whitehead was on hand to record the event for which the Trust is most grateful.